Parkland Shooting Panel Report Calls For Arming Teachers, Chronicles Slew Of Blunders The 439-page report provides an account of what led to the massacre last year and it notes instances in which officials told untruths about what happened and how they responded. A report released on Wednesday concluded that a series of security breaches and law enforcement failures allowed an active shooter to kill 17 students and faculty. A blistering report released on Wednesday by an investigative panel looking into the Valentine's Day massacre at Marjory Stoneman Douglas High School in Florida last year, exposes a litany of school security breaches and chaotic protocol leading to the deaths of 17 students and faculty, and it recommends arming teachers to prevent or slow future on-campus attacks. The probe also tears into school staff and sheriff's deputies involved in the incident, some of whom it says contradicted "ample evidence" captured on video and audio surveillance footage. The Public Safety Commission argues they either intentionally told falsehoods or offered differing accounts due to incompetence. "All stakeholders—school districts, law enforcement, mental health providers, city and county governments, funding entities, etc. — should embrace the opportunity to change and make Florida schools the safest in the nation," the report says in its opening pages, which includes short biographies of each of the victims. "There must be a sense of urgency—and there is not, across-the-board—in enhancing school safety," it says. The analysis, comprising a 439-page report, examines "what happened leading up to the shooting and the law enforcement response." That includes a moment-by-moment recounting of the shooting as well as a comprehensive scrutiny of the shooter's life – Nikolas Cruz — from birth through the Feb. 14, 2018. The report and its recommendations were sent to the governor's office and legislature for consideration. "We will not wait, we will be vigilant and we, like the legislature, expect compliance and change with urgency," the Commission says. 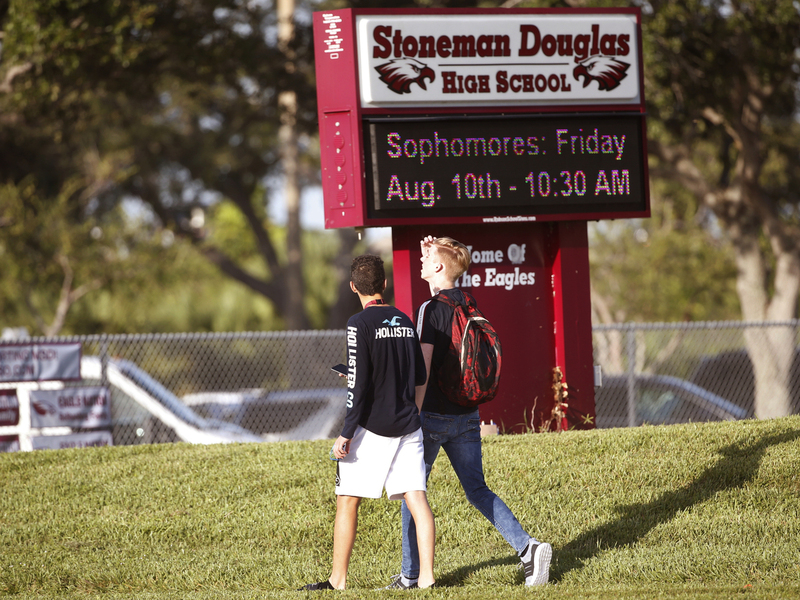 Among the most controversial recommendations for the state legislature is that it should expand the Coach Aaron Feis Guardian Program "to allow teachers who volunteer," and get training, to carry concealed firearms on campuses. President Trump has repeatedly called for arming teachers as a means of making schools safer spaces. "We have to have offensive capability to take these people out rapidly before they can do this kind of damage," Trump told reporters at a news conference in the weeks following the tragedy in Parkland. He also reasoned that security guards "don't love the students" as teachers do, NPR reports. Additionally, the report notes that a recent shift in policy by Broward Sheriff Scott Israel, telling deputies that they "may" enter a building where there is an active shooter, where previously they were trained to enter, created confusion and led to inaction by eight deputies responding to the active shooter. According to the report, Deputy Scot Peterson, the school's only dedicated armed security officer on the day of the shooting, opted not to enter the building where Cruz had begun firing on students and teachers. Instead, he took up what the report calls a "hiding place" at the base of a stairwell for 48 minutes and only emerged after Cruz had run off campus and into the surrounding neighborhood where he was eventually arrested. The report also notes Peterson was repeatedly untruthful about where he was from the moment he first heard the gunshots through the end of the massacre. In a statement given on Feb. 16, 2018, to the Broward Sheriff's Office, Peterson said that he was in his office at the time he heard what he believed to be firecrackers. But video indicates he was elsewhere on campus. Similarly, it details several instances in which parents and students allege they approached Principal Ty Thompson and Assistant Principal Jeff Morford with concerns about Cruz' behavior, claims both men deny. Still, the report says, "Investigators found Morford to be remarkably absent-minded in remembering details about various events and/or being intentionally deceptive." The panel called for a broad evaluation of existing mental health and social services "to ensure they are producing the desired results." It stressed services should focus on "evidence-based best practices with specific metrics to measure outcomes.